While there are many fantastic products going around, there is nothing more that floats our boat than solar. It’s perfect for our type of travel when we regularly are away from 240v power access, so it allows us to do what we really love. Let’s explain. These days we’re pretty well on the road travelling more than we are at home, so we sometimes like to travel with a few home creature comforts like a freezer, 12v air conditioner, electric blankets, and a bread or coffee machine. But we also have several power-hungry photography devices and 18v tools that need recharging which means we can consume a considerable amount of power. So this is where having a good solar solution kicks in to help meet our power requirements. When we bought our first solar panel, it was around 10 years ago. Back then it was a set of rigid folding panels with built-in regulators…it was expensive, but it was good at the time. Today, the world of solar has changed. 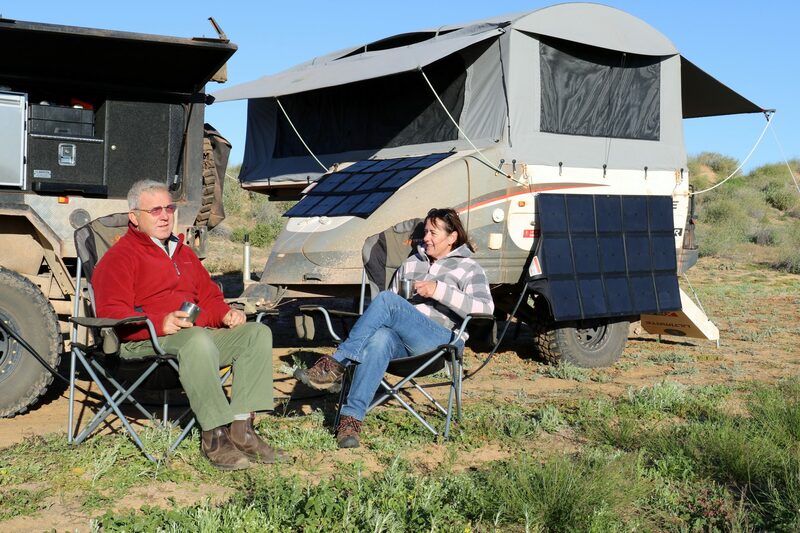 While you still can get these types of panels, along with the fixed solar panels which we currently use on our setups, caravan and camper, there was a new kid on the block we were keen to try out to complement our “on the go” travelling style – the solar blanket. We were quite specific with what we were looking for in a solar blanket, so it had to tick all our boxes. Firstly, it was important that it worked across the range of battery types we have in our setups – lithium, AGM and flooded wet cell cranking batteries. We also wanted something that would allow our setups to plug straight into a DCDC charger, but was also lightweight and could easily be packed away. As we also like to travel during warmer times, were looking for a blanket that could be located out in sunlight and angled accordingly, while we could park our van or camper away in the shade. We found the REDARC 150w solar blanket ticked everything in a solar blanket that we were looking for. 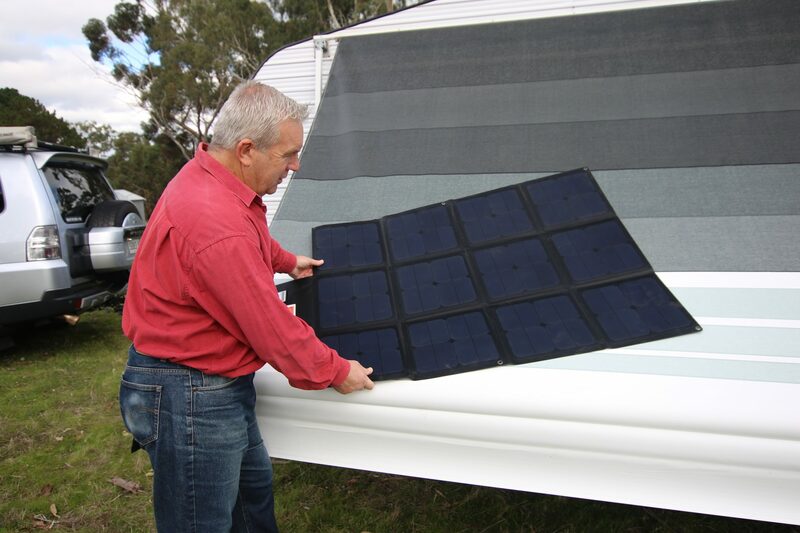 The REDARC black Sunpower Monocrystalline blankets which we chose uses Sunpower cell technology. It’s said this technology captures more sunlight than standard crystalline cells due to their unique design as it omits gridlines on the front of each cell. 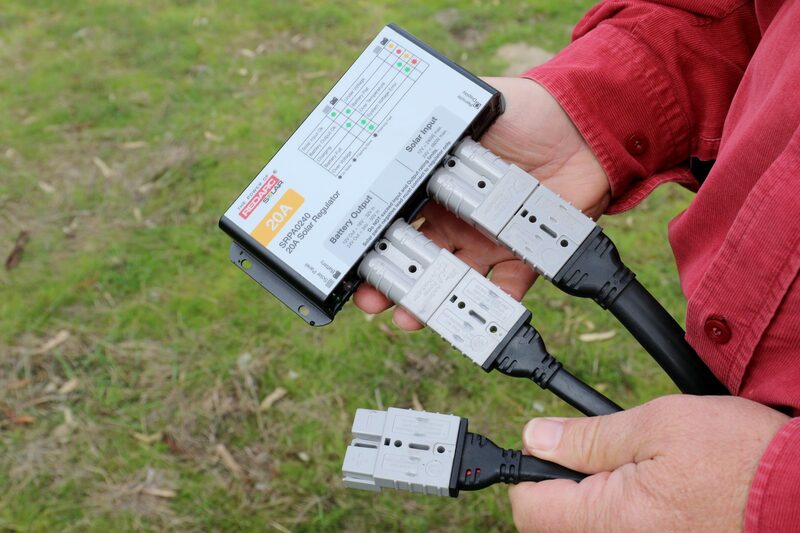 Out of the box, the rigid Sunpower cells are attached to a backing plate, and it is a simple plug and play setup using Anderson type plug connectors. The anti-reflective and scratch resistant blanket also has no rigid frames, so it packs down neatly to the size of a laptop computer bag which makes it ideal for storage. Once opened out, the 150w blanket measures 1405mm x 930mm, and can only be folded up one way which can take a little practice (just like origami)! The eyelets provided on the outer edge of the blanket also allow it to either be pegged down in windy weather or attached to a vertical object. Other than the blanket itself, there is a cloth drawstring bag supplied for storing the blanket. The unit tested weighed in at only 6kgs, and comes with a two year warranty. When conditions are perfect, the panels can produce 18v, so you’ll need a quality regulator to control the voltage to prevent overcooking the batteries. Another tip is to always aim to use quality thick cables over a short length where possible, but more importantly, have your regulator as close to the battery as possible to reduce voltage drop. We like the fact that the blanket is half the weight and size when compared to our equivalent glass folding panel, and we also found the solar blanket highly efficient. Having the flexibility to use the blanket across our windscreen is also a bonus, as it doubles its use as a sunshade. The blanket’s eyelets also mean we can easily hang it off the side of roof racks or the side walls of our RV to maximise our ability to catch the sun. On top of this, we like being able to use the blanket across our setups. For our lithium setup, we simply plug it into the DCDC charger, whereas we plug it into an Anderson plug connection for our caravan’s AGM batteries. And by using a portable regulator, we can quickly recharge our wet cell cranking starting batteries. For our purposes, it’s great all round. Check out our video review for more details. Sizes: 3 sizes of the blanket are available – 115w, 150w, and 190w. Prices: RRP starts at $1,199.